French company Pixium Vision will be starting human trials using its Prima Bionic Vision Restoration System. This consists of tiny wireless sub-retinal implants. The PRIMA implant is a photovoltaic chip about 2mm square and only 30 microns thick. That’s tiny, but the device has 378 electrodes. The patient uses a device that looks like a conventional pair of glasses but contains an integrated camera that sends data wirelessly to a small pocket-sized image processing computer. This computer then commands the glasses to send data to the implant via invisible infrared light. The chip converts the light to electrical impulses and conducts them to the optic nerve. The implants are geared to help people with age related macular degeneration (AMD), which is the leading cause of vision loss. Although the glasses appear to be a bit thick, the trade-off is well worth improved eyesight. The company has already had success in rats and cats, so they are moving onto bigger work as stated on their site. “The initial goal of PRIMA is to deliver improved visual perception potentially to the level of direct facial recognition”. As they say in Star Trek—make it so! The VISOR, acronym for Visual Instrument and Sensory Organ Replacement, was a medical device used in the Federation to aid patients who have suffered loss of eyesight or who were born blind. 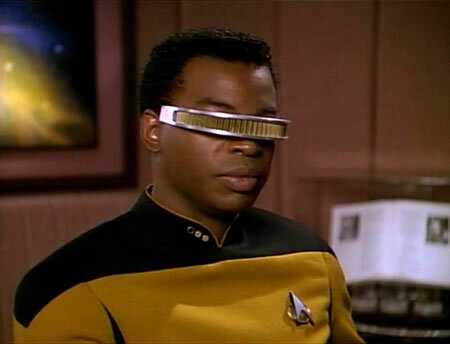 The VISOR detected electromagnetic signals across the entire EM spectrum, between 1 Hz and 100 000 THz (TNG: "The Masterpiece Society"), and transmitted those signals to the brain through neural implants in the temples of the individual via delta-compressed wavelengths. The result was a vastly different visual acuity, with VISOR-wearers able to see in the infra-red and ultra-violet ranges, and beyond. Via Prixium Vision and adafruit. Thanks to Winchell Chung, the hard-science SF writer's tech support of Atomic Rockets for passing on the tip for this story.